I never though away left over yarn. No matter how little it is. 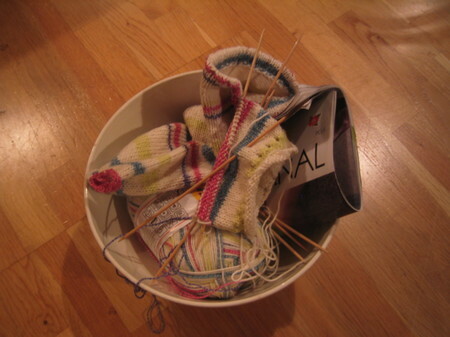 Being a knitter for 50+ years means that I have a lot of left overs in bags and baskets. From time to time I decide to do something with all this yarn. Like knitting socks for little Leander. He started kindergarten a couple of months ago, and with a cold winter ahead he will need lots of warm sock. You know, that´s what grandmas are for. To keep the small feet of their grandchildren warm. And to purt small prayers into every knit and purl. 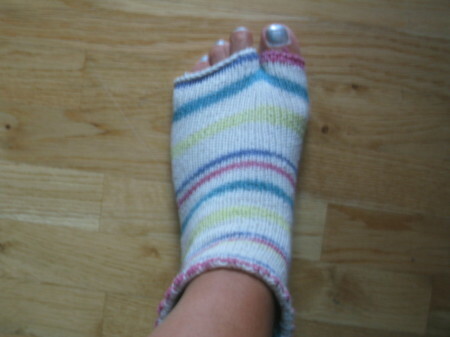 Wow, I am amazed by all the wonderful people out there who are deraming of a pair of handknitted socks :-) If I was a magican I would knit for your all. I am not giving away my table cloth though. I bought it in India, at a special art market, and I have used it every day since I came home tree years ago. The colours on the photos are not the best ones, I shot the photos last night, in lamplight. But you get a good idea of the handiwork. I have looked through my sock and decided I can give away two pairs. Then my email was busy yesterday. Two of my dear friends and blog readers, both farmer´s wives, one Austrian, one Norwegian, both sock knitters, wrote me that after reading your comments, they wanted to take part in the giveaway. So suddenly there are four names to pick. Dagmar lives on a huge dairy farm in a charming little village in Southern Austria. Granny (as she calls herself when she comments in The House in the Woods), is Norwegian, living on a farm only 90 minutes from Trondheim. When we had visitors from California this summer, Granny invited us all to her farm, and when we arrived, on our way to the cabin, she served us her wonderful, rich, tasty fish soup. Granny is also a knitter. Dagmar and Granny have so much in common. Not only farming and sock knitting. But, this was not meant to be a post about Dagmar and Granny. Back to the socks and the drawing. Send me an email with your address. Mouse and yael, I will forward your emails to Granny and Dagmar. The warm autumn days with their low, bright sun are soon history. 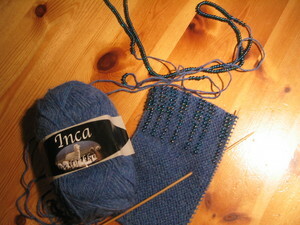 I am knitting socks, preparing for a long, dark, cold winter. I knit more than I need myself. A lot more. Now I have an extra pair in blues (not the one on the photos) and I want to give it away. To one of you! Tell me in the comment section here why you want the blue socks, and I will draw a winner during the weekend. The orange book is my New Testament. Prayers in every knit & purl. Knitting during long and dark nights. Knitting is a perfect pasttime when autumn comes. During the summer months I love to spend time in the garden in the afternoons and nights, but now the daylight is almost finished when I finish work. And we can't go out on flash light hikes every night :-) Besides reading and listening to opera, knitting is my favorite activity in autumn and winter (though different types of crossword puzzles and sudoku's are also fighting for a place on top of that list). 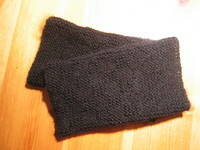 A few days ago I finished a pair of fancy socks which are now on their way over the Atlantic to a new owner. 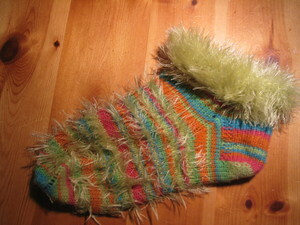 I have been knitting socks today. I'm having a break in my exams working and spend a quiet night watching the European Song Contest. And with one of my favorite hobbies, knitting. 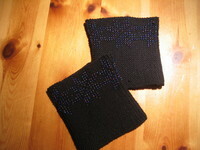 I am working on a pair of pulsewarmers right now using bigger beads than I have used before. I am not sure if I am satisfied with the resu lt, but at least it is something different and worth trying. Though when these are finished I will go back to the very small beads again. They are more difficult to work with, but the effect and the resu lt is so beautiful. The photo to the right show the first pair I made , several years ago, the next photo shows my latest ones, with black beads on black yarn. Not easy to see on the small photo (you can see a bigger photo if you double click on it), but the result is great. Sock knitting has been a favourite for a long time, and my girls love to wear the socks I knit for them - which means that the socks are always well worn before I manage to take a photo of them. Those in this photo I made for Marta a few weeks ago, and she started to use them right away - you can see that the heel is not quite clean any more. Knitting necklaces is also something I have started to do lately. Have tried different designs (all of them my own) but have not found the perfect one yet. Still trying though, and one day I will show some of them here.